Match 3 or more fruits to gain the highest score possible with the minimum number of moves. If you run out of potential matches, or you line up 3 or more wasps, then it's game over and try again! To create a match select and drag a row or column into place to create a match of 3 or more fruits. The rows and columns wrap-around so you can drag in the direction that you want. 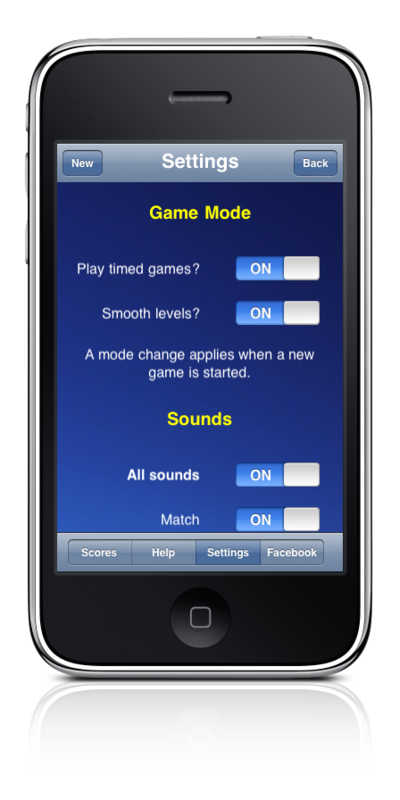 There are 2 game modes: Relaxed and Timed, both have high score tables. Relaxed mode is not timed and you can take as long as you like before making a move. Timed mode starts a timer for each move. If you do not make a move in time then it's game over. The timer is shown as a green-to-red bar growing from left (green) to right (red) and is shown on the top toolbar. 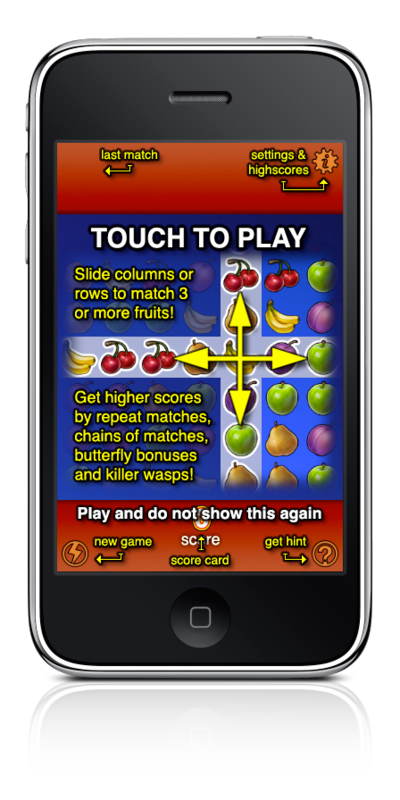 Points are awarded for fruit matches of 3 or more, with special bonuses for using butterflies and wasps. A match that contains 1 or more butterflies is multiplied by 10 times the number of butterflies in that match. If there are 3 or more butterflies in a row then that becomes a match on its own. A match that contains 1 or more wasps will clear out the lines crossing at the wasps' locations. If there are 3 or more wasps in a row then that becomes a match on it's own and will cause game over. Butterflies and wasps are wilds and must have the same fruit before and after to be part of a match. Blank spots can only be removed when they are on a cross-line cleared by a wasp. When multiple matches are available then the game will try to award matches to maximize your score. Lowest value to highest value. A chain is a group of successive matches from 1 line movement. Each successive match in a chain awards an increasing bonus, not dependent on the match itself. The previous fruit match is shown in the top-left of the game screen. When your next match matches the previous match a repeat multiplier is awarded. Each successive repeat-match earns a higher score multiplier. Game over occurs when there are no more matches to be made, when 3 or more wasps line up or when time runs out in timed mode. 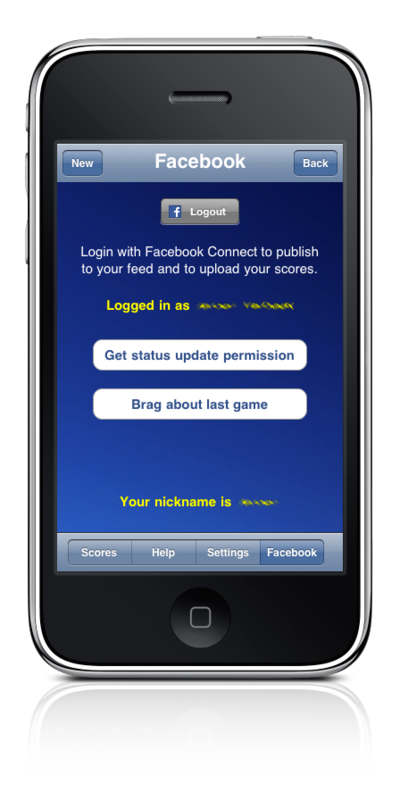 A Facebook account is currently required for all online features, including the world wide high score table. After logging in with Facebook Connect you need to register a high score table nickname if you want to be able to submit your high scores. Before you can Brag to Facebook you need to allow Fruity Match to update your status, press the "Get status update permission" button to allow this. World wide high score tables can be seen in the "Scores" page of the info pages and also online at www.fruitymatch.com. Butterflies and wasps have a limited life and have to be used within 8 moves of appearing. If a butterfly is unused after 8 moves then the butterfly will disappear. An unused wasp will clone onto the most valuable spot next to it and have it's life restarted. When Fruity Match is animating and awarding matches any moves or touches will be ignored. You have to wait until all current matches have been awarded. Shows the info pages (the pages you are looking at now and the settings page in the screenshot on the left). Starts a new game and asks for confirmation. Highlights a possible match if you can't find one. Be warned: 10 times the value of the first match afterwards is subtracted from your score!